Nearby nature and sea "Polymnia Apartments" offer a friendly ambient for your pleasant staying. They are ideal for families and for peacefull and unforgettable holidays. Pleasant vacations in quiet and friendly ambient , only 200m near the sea. Fully equipped and spacious apartments (self-catering) with two bedrooms that may accomodate up to 6 persons. Each apartment has 2 big bedrooms, spacious living room, fully equipped kitchen and bathroom. Also we offer baby cot and high chair on request. The apartments are comfortable, and afford air-conditions, televisions and wireless-internet. Also there is available a studio with one bedroom with ac and tv, kitchen and bathroom. The apartments have large verandas and balconies with a view to the sea. The complex is surrounded by a large garden with grass, trees and flowers. Garden well maintained for children to play. In the garden you can find barbeque, pergola, showers, washing machine, and a covered dining area ideal for dinner and overlooking the sea. Parking on site. Plenty of car space and places for leaving boats and trailers. Pets allowed upon request. There is no infrastructure for accommodaitng people with disabilities. With your arrival : Welcome Packet & a Map with all the sights of our island. 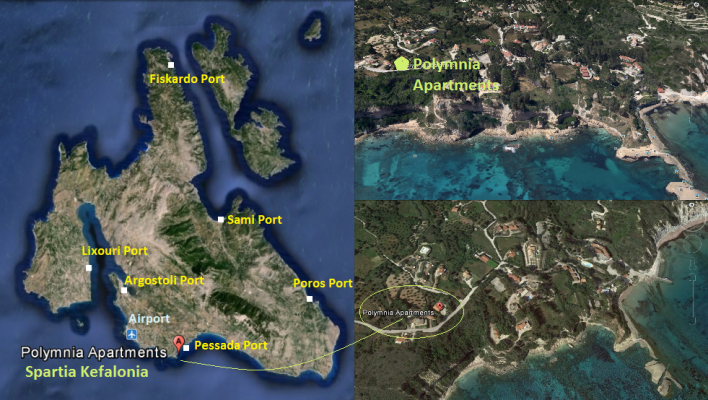 Polymnia & Dimitris are promised to have a wonderfull holidays in Kefalonia.